Today marks the first day of regular season play in the NFL. The Saints and Vikings will replay last year’s NFC Championship. Personally, I like the Vikes tonight. As for the other 30 teams, here is where I think they end up in order of division finish. New England Patriots: Tom Brady has had over a year of recovery time, apparently Wes Welker has Wolverine’s healing powers (or HGH) and the Pats continue to carry 4,569 running backs. The defense isn’t pretty but Bill Belichick will find a way to get the group in the top-10. New York Jets: I think Mark Sanchez is still too shaky as a starter in the NFL. Maybe he will prove me wrong and blow up for 5,000 yards. Or maybe he and LaDanian Tomlinson will have sub-par years that don’t live up to their hype. Either way, the Jets ‘D’ will carry them. If Dustin Keller can be an adequate security valve for Sanchez and Shonn Green runs for a million yards, the Jets will do fine. Miami Dolphins: The Dolphins did quite a bit of retooling in the offseason. However, I don’t think they are good enough to top New York and New England. That’s ok, they will improve. Especially Chad Henne, his career arc is key for the long-term viability of this franchise. Buffalo Bills: I love this team. Unfortunately, they aren’t going to be very good. No matter how much time he gets, Trent Edwards will just be o.k. Add to that the fact that his line isn’t much better than last year – yeah, I figured you could do the math. C.J. Spiller is exciting and the secondary is sick. I still think they will yield a lot of rushing yards but that is to be expected with the change in scheme. I just hope to God they are willing to spend the money on Jake Locker next summer. 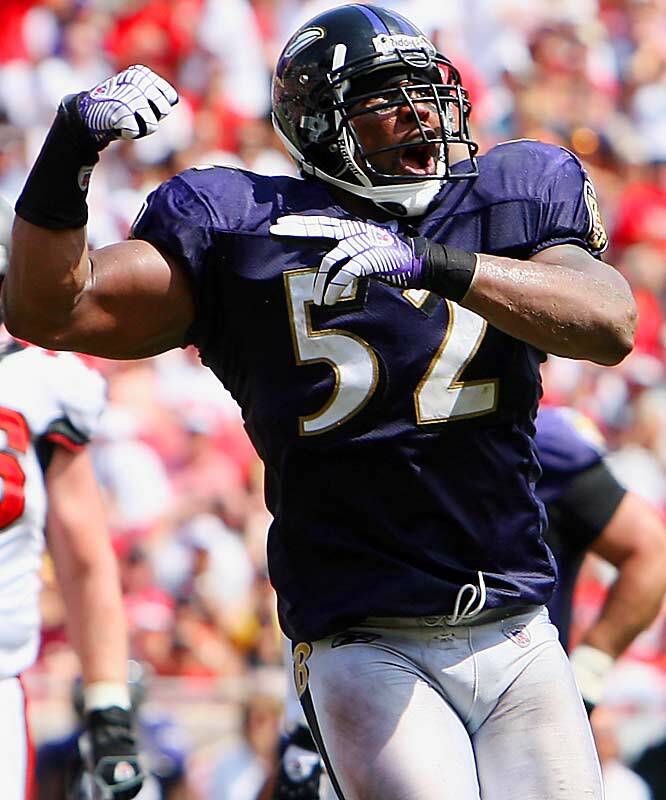 Watch out for Ray Lewis and the Ravens…on the field too. Baltimore Ravens: Sure their schedule is tough – so is their division. Joe Flacco will get the job done. More importantly, Ray Rice will get the job done. The defense speaks for itself. If this team is healthy they are a Super Bowl contender. Cincinnati Bengals: I will forever be a Carson Palmer fan. I think having T.O. and Ochocinco as his top-two targets will help him. Jermaine Gresham certainly won’t hurt and Ced Benson is running like his is wearing white and burnt orange again. If the ‘D’ holds up they could be a wild card team. Pittsburgh Steelers: Maybe if Byron Leftwich wasn’t hurt they would fare well in Big Ben’s absence. Scratch that, if Big Ben could keep it in his pants the Steelers would win the division. The Steelers defense will always be stout, the run game will suffer while Dennis Dixon is at the helm. How they handle the first few weeks will determine their fate. Cleveland Browns: They seemingly have the same fate as the Bills. However, their ownership seems to acknowledge the fact that things need to change so they hired Mike Holmgren. Things could be on the rise in Cleveland. Or Holmgren will leave for Miami in a few years. I can’t be 100% sure. Matt Schaub and the Texans, still a step or two away. Indianapolis Colts: Is there any doubt here? Barring a catastrophic occurrence in which Peyton Manning gets hurt the Colts will likely go 14-2 with their terrifyingly good offense carrying their average defense to the AFC Championship – and perhaps farther. 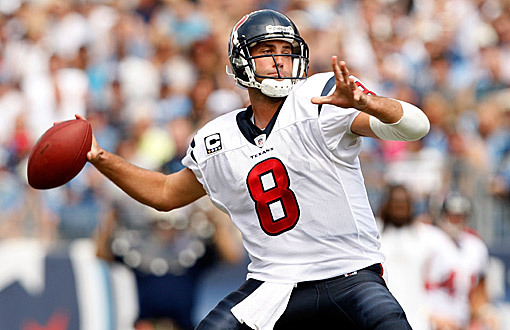 Houston Texans: Matt Schaub is good, so is Andre Johnson, so is Mario Williams. See where I am going with this? The Texans are good. They will contend for a wild card spot. Although I feel like they might just miss the boat, sorry Houston. Tennessee Titans: Chris Johnson will rush for 2,200 yards this season. Actually some nerd in the greater Nashville area will have the guy run for 3,000 on Madden and say to his buddies ‘I don’t see why the Titans can’t do it in real life!’ But to be serious, Vince Young will be serviceable but the Titans as a whole won’t be good enough to break the 10-win mark. Jacksonville Jaguars: Maurice Jones-Drew is having knee issues. For a shifty, every-down, face-of-the-franchise that is terrible news. Either way the Jags wouldn’t have been all that fantastic. Not that it matters, they only play in front of 45,000 people. Why is there all this talk about the Bills moving when we sell out each week while the Jags play to a Div-II capacity and are never on the chopping block? Send them to LA and let Ari Gold sink his teeth into them. San Diego Chargers: Even without Vincent Jackson they will win the West. I don’t know if losing him will help them come playoff time. But, his absence won’t hurt the Chargers during the regular season. Everyone loves Ryan Matthews, I hope he doesn’t stink come week one and beyond. That could spell doom for the Chargers. Denver Broncos: Kyle Orton will be good enough for nine or ten wins. The Denver defense will be just as good. And there will likely be a 1,200-yard rusher….it must be that mountain air. But, they won’t be good enough to top the Chargers. Kansas City Chiefs: Matt Cassel will be better with Charlie Weis calling plays. Thomas Jones, Jammal Charles and Dexter McCluster won’t hurt either. The defense will bring this team down. Another high pick plus a second rounder spent on the ‘D’ and Arrowhead will start becoming an imposing building to play in once again. Oakland Raiders: Mail in it. Lets just wait until the draft and see which 4.34 burner the sliver and black pick in the first round instead of addressing a real need. I will give them kudos on snagging Rolando McClain this year, he is the real deal. Likely the face you will see when the Cowboys aren’t playing in Super Bowl XLV. New York Giants: The G-Men are my pick to come out of the NFL’s perennial cluster division. It seems each season all four teams scrape and claw their way through respectable years and each season one comes out 11-5 and the others fall in between 9-7 and 5-11. The Giants have the QB, running game and defense to win this division. Although, don’t be surprised if a bad bounce or two knocks them to third. Dallas Cowboys: Since I don’t think Tony Romo is all that as an NFL starter. And I don’t think the team as a whole will live up to the pressure of a possibility to play the Super Bowl at home. I think it is safe to say they will play well but stumble on their way to second-best in the East. Dez Bryant will make this offense seriously good, however. Washington Redskins: Toss a coin for third and fourth in the East. Donovan McNabb will find a way to get the ‘Skins a few more wins than last year – or at least a few more wins than the Eagles. The 3-4 switch may take a year, once the personnel are in and the players adjust to the scheme, the Redskins will improve. Philadelphia Eagles: Kevin Kolb will not be the gunslinger he was last year. Sure, he will throw for a ton of yards. But, he will not win games in this fashion. I don’t love LeSean McCoy as the feature back there and I think the weak running game will eventually wear on the passing game in Philly. Minnesota Vikings: Brett Favre will not have the same season he did last year. It just isn’t possible. However, he will still win games. That is what the man does. Adrian Peterson will run for a bunch of yards, the defense will keep the points against low and Favre will have one job: don’t turn the ball over. If those thing happen, the Vikes will be sniffing around the NFC title game once again. Green Bay Packers: If they don’t win the North the Pack will be a wild card team, no doubt. Aaron Rodgers has become Favre 2.0 up in Green Bay, minus the terribly timed interceptions. The Pack will need strong play from the o-line (questionable) as well as stout defense to contend with the Vikings for the division title. Chicago Bears: The Bears are pretty much holding down the third spot until the Lions are prepared to take it from them in the next couple seasons. Chicago has made some great moves over the past few seasons but I feel like they are the Mets of the NFL. No matter what stars they bring in, they don’t translate to victories. Lovie Smith is going to have a tough time keeping his job after this season. Detroit Lions: Matt Stafford is progressing, hopefully his line follows suit. Jahvid Best could provide the Cats with a scary dual-threat out of the backfield. The defense is still one or two years away from being seriously stout. Ndamukong Suh will play a big role in that progression. Another top-10 pick (not spent on a WR) will continue to build a potential powerhouse. Drew Brees and the Saints should have little trouble repeating as NFC South champs. New Orleans Saints: Drew Brees with throw for a gazillion yards this season, that much we know is true. Sean Peyton invariably will come across like a jerk, either on the field or in the press – the same goes for Gregg Williams. Also, the defense will be just as aggressive as last season. Not too much has changed for the defending Super Bowl champs, don’t be surprised if they make a return trip. Atlanta Falcons: Michael Turner and Matt Ryan will keep the Dirty Birds in the wild card hunt. If the defense can step up and be elite the Falcons could be in for a good playoff run. Carolina Panthers: I think Matt Moore will throw less interceptions this year than Jake Delhomme did last season. However, I don’t know if this kid will win many more games. Don’t be surprised to see the Panthers go QB in round one of next year’s draft. By the way, DeAngelo Williams and Jonathon Stewart will still run for a ton of yards, don’t worry fantasy owners. Tampa Bay Buccaneers: Even though the Bucs probably will still be picking in the top-10 in the draft that is ok. I think Josh Freeman will excel in his first full year as a starter and the rest of the team will follow suit. Even though Tampa will likely fall short in terms of success the upside for this franchise is very high. Will Mike Singletary and Patrick Willis lead the 49ers to the NFC West title? Seattle Seahawks: The NL West and NFC West have some great similarities. They are largely irrelevant to everyone and most of the teams are mediocre. I am taking a big risk picking these guys first. But, I feel like Matt Hasselbeck is due for a bounce back. At least he deserves one, he is probably the nicest dude in the NFL. I like Pete Carroll to turn this club around this season. The fact that they are in this division seriously helps. San Fransisco 49ers: Probably the team that will actually come out of the West. But I wanted to shake it up. Besides, Alex Smith still doesn’t have me convinced. Frank Gore and Vernon Davis will provide a bulk of the points out on the Golden Coast. Lets see if Mike Singletary can continue the improvement with this ball club. Arizona Cardinals: Who would have thought losing your QB would do so much damage to your franchise (see Buffalo Bills after Jim Kelly). Matt Leinart is now with Houston. Derek Anderson couldn’t start for Cleveland a year ago and now he is at the helm out in the desert. Losing Anquan Boldin will destroy Larry Fitzgerald’s numbers – both real and fantasy. It was always my contention that Boldin was the key to the Cardinals offense, not Fitzgerald. I really hope I’m correct. St. Louis Rams: The Rams still need a few years. But, they are headed in the right direction. Sam Bradford appears to be a seriously good NFL QB. I think in a couple of seasons the Greatest Show on Turf might be back for another run. Peyton will be able to shoot way more commercials after winning a second Super Bowl. 3-13 season or not, Go Bills.